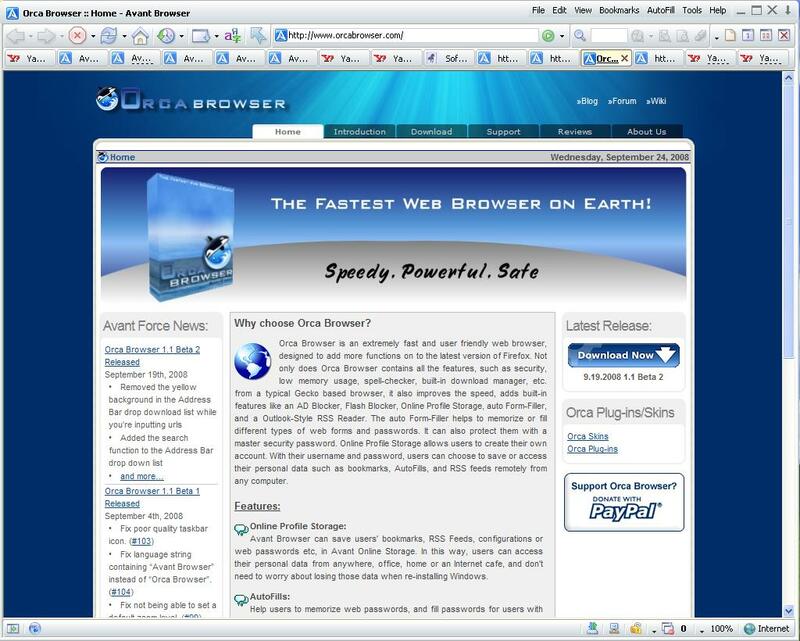 Orca Browser is a fast, stable, user-friendly, versatile tabbed browser.Orca Browser allows user to browse multiple Web sites simultaneously and block all unwanted pop-up pages and Flash Ads. Its comes with online profile storage. The AutoFills help users to memorize web passwords. The integrated cleaner helps user to clear all traces and keep privacy. Built-in Yahoo search engine enables user to search for web pages and images in Internet. *AutoFills: Help users to memorize web passwords, and fill passwords for users with one click. *Flash Animation Filter: More than 85% of all flash animations on web pages are advertising, and normally take up to 90% of the size of the page you're visiting. With Orca Browser you can save the bandwidth by blocking the download of these flash files with just one easy click. *Built-in AD/Pop-up Blocker: Easily eliminate unwanted AD banners and pop-up pages automatically with just one click. *Built-in RSS/ATOM Reader: Orca Browser has a built-in RSS/ATOM Reader, which allows you to read RSS/ATOM feeds just like browsing web pages. And you can also keep your favorite feeds as bookmarks. Qweas is providing links to Orca Browser 1.2.0.6 as a courtesy, and makes no representations regarding Orca Browser or any other applications or any information related thereto. Any questions, complaints or claims regarding this application Orca Browser 1.2.0.6 must be directed to the appropriate software vendor. You may click the publisher link of Orca Browser on the top of this page to get more details about the vendor.